Donald Trump was forced to disband two White House business councils that were disintegrating around him on Wednesday in the wake of his controversial remarks about the weekend violence in Charlottesville. The Strategic and Policy Forum and the White House Manufacturing Jobs Initiative were both dissolved as corporate leaders continued to resign. The collapse of the advisory bodies follows seven different corporate leaders stepping down from the two councils in recent days including the CEOs of both Campbell’s Soup and 3M on Wednesday. Trump had previously stated that resignations from both panels were of no consequence. “For every CEO that drops out of the Manufacturing Council, I have many to take their place. Grandstanders should not have gone on. JOBS!” he said on Twitter on Tuesday. Wednesday’s abrupt decision came after Trump confidante Stephen Schwarzman, chief executive of the Blackstone Group, held a conference call for about a dozen members of the strategic and policy forum who decided to abandon it, the New York Times reported. Executives from the manufacturing council had been due to hold a similar call that afternoon, the paper added. On Wednesday, corporate leaders who sat on the councils raced to denounce Trump’s comments about Charlottesville and to support the dissolution of the advisory bodies. Jamie Dimon, the CEO of JPMorgan and a member of Strategic and Policy Forum, said in a statement: “I strongly disagree with President Trump’s reaction to the events that took place in Charlottesville over the past several days.” He added that he agreed with the council’s decision to disband. Jeffrey Immelt, the CEO of General Electric, who had previously said on Monday that he would not step down from the manufacturing advisory board, put out a statement on Wednesday afternoon announcing that he had resigned. Three members of the manufacturing council resigned on Monday after Trump’s initial refusal to condemn the neo-Nazi and white supremacist protesters in Charlottesville by name. Two more followed on Tuesday after Trump defended some of the protestors in a press conference at Trump Tower. The president targeted one of the CEOs, Kenneth Frazier of Merck, in two tweetsincluding one where he mentioned Frazier, the lone African American CEO to step down, by name. What is most striking about the events of last week was the slow reaction of these executives, particularly from firms who champion diversity and inclusion. Merck’s CEO, who was the first to act, felt compelled to leave the council due to a matter of personal conscience. This was a minority opinion, and may CEOs were determined to remain, despite the President’s refusal to condemn extremist hate groups. To quote from the Washington Post, some, such as the four government contractors on the president’s advisory councils — Lockheed Martin, Boeing, Harris Corp. and United Technologies — waited until after the councils had disbanded to publicly weigh in, if they did at all. Even then, several stopped short of singling out the president for blaming “both sides” for the violence at a white supremacist rally this past weekend in Charlottesville. Other, such as PepsiCo’s Indra Nooyi, personally condemned the violence, but failed to act beyond that. Heartbroken by the violence in #Charlottesville. Hate and intolerance are a betrayal of what we stand for as Americans. So, what was behind the inability to move? Did these executives believe that it was worth remaining to engage with a President whose position on the Charlottesville events has been condemned? Corporate leaders have to choose; they can no longer sit on the fence. And they have to be prepared for the backlash, particularly from a President who takes anything and everything personally. Corporate leaders also need to act individually, as the CEO of Merck did – it’s telling that the CEOs who stuck it out decided to end the council via a conference call, preferring collective responsibility over personal ownership (which seems to be a habit of corporate life these days). I hope those leaders who didn’t criticize what happened last week finally do so. Apple’s Tim Cook has been vocal about his position. It’s time to get off the fence people, and not only say what you believe in and advocate for as a company, but turn those words into actions. There’s no limit to the respect I have for good journalists. These people can toil away for weeks and months on a story, digging for a piece of information or a lead that will result in the next big story. We aren’t blessed with a great deal of original breaking news in the Gulf region; much of what there is out there is, I’ll admit, news which companies want to release to the media. It’s refreshing to see news which isn’t essentially public relations, a story which has been diligently worked upon by an investigative journalist. 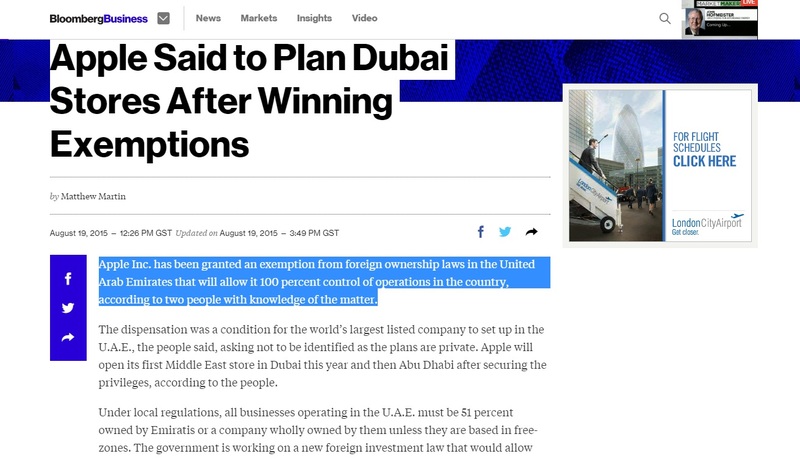 One piece piqued my interest this week, the news of how the IT giant Apple has been granted an exemption from the UAE’s foreign ownership laws to fully own its operations in the UAE. The piece was written by Bloomberg’s Matthew Martin. What I particularly like about such practices is the debate that it engenders, and how it gets people talking. For me, the story leaves me with a host of questions that Apple and the country’s authorities need to address for the benefit of the wider business community. Let’s hope we see more investigative journalism being practiced in the Gulf region. Goodness knows we need it. Has Nokia refound its mojo? And is Microsoft responsible? Years ago, there was only one, the phone to rule all phones. No body ever asked for a phone. They asked for a Nokia. Saudi Arabia was the land of Nokia. And the rest of the Gulf wasn’t far behind. One tale I was told about the Finnish phone behemoth was that Saudi was the largest market worldwide for Nokia’s Communicator series of phones. Saudi ten years back. Yes, Saudis loved their Nokia Communicators (this isn’t a Communicator but they’re about the same size). And the came Apple, followed by Samsung, HTC, Blackberry and other mobile devices of all shapes and form. And Nokia was no longer the same company that it was before. But then, there was a change. Nokia came together with Microsoft. And something new was born. The Lumia 920 in all its glory. Yellow is optional. The portents didn’t speak well for the partnership between the two companies. I remember owning a Windows-based SPV phone about ten years ago. While the phone did last, it wasn’t the easiest device to use. Microsoft hasn’t had a good track record when it comes to mobile operating systems. And Nokia’s Symbian has died a death. How would the two companies compete with Apple’s iOS software and Google’s Android platform? As a reformed optimist and a gadget monster I took the plunge and ordered a new Nokia Lumia 920 on its release last month. I liked the look of the hardware – the Lumia has a 768 by 1280 pixel screen which is slightly larger than the iPhone 4, a 1.5GHz dual-core Qualcomm processor, 32Gb of storage, an eight megapixel Carl Zeiss lens camera, NFC, Bluetooth, HSDPA and HSUPA connectivity and all the Wi-Fi that you’d need. The phone is chunkier than most, weighing in at 185 grams and with a dimension of 130.3 by 70.8 and 10.7mm, but I like my phones chunky and plumpy. Going beyond the hardware, what I liked most about the new Nokia Windows-based lineup was the software. The operating system is simple to use with tiles on the front page to heavily-used applications and functions. The front screen can be easily customized to meet the needs of the user, it’s intuitive and copying files to and from the phone is so simple (though Microsoft still needs to work on the Windows Phone app which tends to crash when copying music). I can also sync files to my desktop and laptop using Microsoft’s Skydrive. All in all, the phone’s operating system is a joy to use and Microsoft is heading in the right direction when it comes to usability (though I’d love to see more shortcut buttons or tiles. But there’s more good stuff to come. Nokia has long been a leader in the maps space following its acquisition of Navteq in 2008. The maps on the Lumia 920 are rich with detail including 3D rendering, they’re simple to use and most importantly they’re full of detail. With Nokia Drive you can do away with any other GPS software and hardware you may use for driving. Again, the system is easy to use, the voice directions are clear and I haven’t found any glaring mistakes in terms of geography and topography. The most fun thing about my Nokia 920 experience so far is the Nokia City Lens, which is the smartest use of augmented reality so far. Basically, the City Lens allows you to look at the screen and view what locations of interest are nearby (be they restaurants, hotel, museums, shops, or even famous sights). Once you click on a point of interest you’ll be able to view pictures, read reviews and be guided there by Nokia Maps. Much of the content on Nokia City Lens is consumer-generated, which is going to make the application even more interesting as time goes by. As my brief explanation hasn’t the app any justice have a look at the embedded video. I have tried the camera and true to form Nokia’s cameras as wonderfully clear. There’s much more I need to play around with on the camera settings, but I leave the photography to my talented wife. And the downside? The applications, or lack of, currently available for the phone. There’s no Instagram as of yet and no native Twitter application, Whatsapp is still unstable, and compared to the iPhone and Android-based phones Microsoft needs to do more to convince developers to create apps for Windows 8 Mobile. Having tested the phone both at home and abroad I know that Nokia is onto a winner. The Windows 8 environment will grow and develop with time and Nokia has bet its future on the operating system (it’s only crashed twice, which is remarkable for a Microsoft device). I’d love to see Microsoft publicize the operating system more (they’ve been surprisingly quiet in talking about Windows 8 Mobile despite it being crucial to their vision of a connected PC-phone-tablet ecosystem). The question is now, will Nokia pick itself up again in the Gulf? While Blackberry is dying a death globally, the Canadian manufacturer is still doing remarkably well in the Gulf due in part to its Blackberry Messenger Service. Apple retains bragging rights to the best smartphone around, despite (in my view) doing remarkably little with the device since the launch of the 3GS. And then there’s Google. Can anyone stop the search giant with its Android operating system? I’m certainly hoping that Nokia comes back strong. The product is one to shout about. Will its marketing be strong and bold enough to cut through the disappointment and ambivalence that many people feel about Nokia today in the Gulf to rediscover the love affair that they once had with the Finnish giant? Toivotaan niin Nokia! Game on Apple! It’s (hopefully) common sense that leadership can make or break any company or organisation. A leader, normally the CEO, will define the company’s direction, they will set the agenda, lead the execution and innovate. Leaders like Steve Jobs define their organisation and create success on their own terms, much like Dubai’s Sheikh Mohammed Al Maktoum has done. The late, great Steve Jobs has been acclaimed as one of the best CEOs in business. Jobs did it his way, he focused on the business and on creating works of art/technology that changed how we live our lives. For me, the Apple of today is different to the Apple of yesterday. Nothing would go out of the door until Jobs was satisfied that the product was right and ready. A simple example is cited by Mike Elgan in his recent article on Apple. Apple had been developing the iPhone for years. After major arguments about materials, the team had decided to use reinforced plastic on the screens for the first version. That was the plan, and everybody spent more than a year working on it. 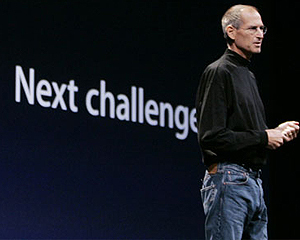 Just one month before the first iPhone shipped, Jobs summoned his team and issued an edict: The screen would be glass. He just didn’t like the plastic screen. Of course, Job wasn’t perfect. He had his flaws. But I can’t imagine that Jobs would have let Apple Maps into the world without the solution being ready (the linked article here does make the point that Jobs himself was late to realize the importance of a maps application). As a leader could we imagine anyone else taking Apple forward better than Jobs? No. That is evident more so today when he’s missed. So how is this relevant to us in the desert? I was talking to a work colleague, a well-respected Emirati, about the Gulf and how it has developed. He was talking about Bahrain, and commenting on how 20 to 30 years back Bahrain was where Emiratis would travel to shop and vacation. What he was saying made sense to me; Bahrain had a well-developed economy at the time and Dubai was setting out on the journey to become one of the globe’s trading hubs. Bahrain was the GCC’s banking hub, Gulf Air was the airline of the region, and the island could do no wrong. Fast-track to today, and it’s as if the roles have been reversed. Dubai is now the trading hub for the region, and it’s the one must-visit destination for business and tourism. Emirates is the world’s largest airline by passenger numbers, Dubai-owned Jumeirah is becoming a global brand for the hospitality sector, and, despite the credit crunch, Dubai is still thriving. As for Bahrain, it’s fair to say that the country isn’t doing as well as Dubai. Countries are no different from companies. The leadership shown by the ruler, the prime minister or whoever at the top can be and often is the difference between success and failure. Nowhere is that more apparent than in today’s Gulf and in the vision set out by Dubai’s ruler Sheikh Mohammed Al Maktoum. Leadership is success, and a lack of leadership can be the opposite. Google, Blackberry and Apple, where’s the Arab content? I had the chance to sit with some very switched on and influential telecoms executives twice this week. While the first was a shin-dig for the most widely respected telecoms awards ceremony in the Middle East, CommsMEA, the other was a tea and dinner with a number of senior people from Saudi Arabia. I love to sit down for a tea or a coffee. You hear more over a cup of warm water and a tea bag than you will ever do in an all-day meeting. The one thing that the executives were discussed was a content portal. One in particular was fed up. He told me, Blackberry and Google move too slow. All Google wants to do is sell Adwords rather than provide our country and region with a portal to sell applications. Let me tell you a bit about apps, in case you didn’t know. Those programs that you can download to your smartphone are big business. The global leader by a mile, Apple has sold or given to iPhone owners 18 billion apps through its online store. Apple today offers over half a million apps to customers worldwide. Well, anywhere apart from the Middle East that is. The problem for most of us consumers in this region is that we cannot pay for content online for our smartphones. Why? Because our credit and debit cards aren’t accepted by these online gateways. While consumers with a US or Europe-based credit card and address can choose from millions of songs, apps, and videos, those less fortunate souls in nearly all of the Gulf can only access free-to-download programs (the one exception is the UAE where Apple launched an online content store for local credit and debit card holders in August of this year). What annoys telcos so much is that they’ve deployed state-of-the-art data networks based on LTE technology. In other words, they’re ready and waiting to see consumers download hundred of megabytes of data a day. Data is the next big cash cow for mobile carriers in the Middle East. So it’s annoying to see yourself all ready to go out and having no ride to get there. But while Apple rules the roost when it comes to content, where’s Google and Blackberry? Everyone I know in this region has a Blackberry device, and yet the only application people seem to use is Blackberry Messenger or BBM for short. Similarly, Google’s Android mobile phone operating system is winning fans from across the region. So why aren’t they willing to beat Apple at its own game and roll out content stores for the region? It’s getting to the point of desperation when operators have to develop their own online content and app store. But if that’s what it’ll take to get Google, Apple and Blackberry moving then so be it. Similarly, the more apps we shift in this region, the more content we’re actually going to get in Arabic (there’s always been a issue in the Middle East with the lack of Arabic-language applications for smartphones). The more content we have in Arabic, the more apps the operators and content owners will sell. It’s simple logic, and it’ll make lots of money. So what are you waiting for Google, Blackberry, and Apple. Where’s the Arabic content. The only thing I’d like to know is whatever happened to Microsoft? PS Claire good to see you at the CommsMEA event. Did you ever hire that comms director?